Relaxing garden, Rural and Bay views. Our section and facilities have been used for several functions and has an environment that caters for 60plus. The Apartment is self contained however we offer meals as extra upon request. Our section produces a variety of garden fruit and vegetables which we welcome you to use. Welcome Bay Road heads towards the Papamoa Hills and on to Papamoa and Tepuke, only 20 minutes away. During the summer months there are many Markets to visit, all within 20minutes away. Smoking is permitted outside the Apartment in the private well covered attached area. Pets are welcome with prior approval. The downstairs part of the Apartment is suitable for toddlers, there are stairs up to the loft bedroom area. As there are fairly step stairs to the Loft bedroom, Parents of toddlers may not find it suitable. 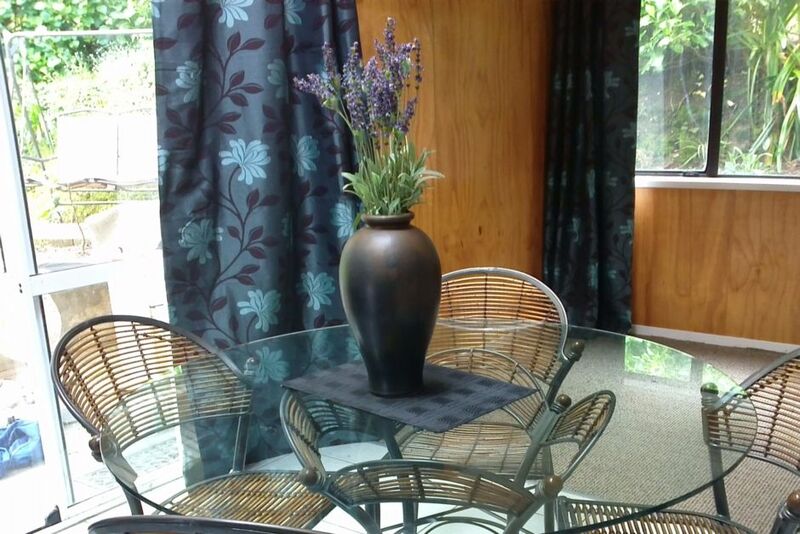 The Apartment is self sufficient and has everything required for a short stay. There is a private courtyard directly outside the living area. Beautiful place, really considerate hosts. The upstairs roof really wasn’t made for taller people but they supplied a hard hat just in case haha. Perfect for us. The kids & dog loved the loft. Comfy beds, clean and tidy. Sorry, can't say we enjoyed our stay as unit not as expected re listing. No lock on ranch slider which was unsettling and no mobile phone or WiFi which was difficult. Adjoining garage door left open on purpose and we were woken with loud bang in middle of night - huge fright as just through wall. Sorry but have to be honest. Nice people though and lovely comfy bed. As mentioned we are unable to do anything about the WiFi internet/phone situation at present - it is out of our control. But again apologise for the inconvenience. The ranchslider is lockable with the wood provided. We checked the garage as suggested and think it was a cat as you suggested. Sorry to hear that you were dissappointed. Great wee spot. Clean. Lots of extra touches. Cali Quail on lawn. Gorgeous cat. Milk in fridge. Well done guys.